(CNN) -- Former Vice President Al Gore endorsed Democratic presidential candidate Barack Obama on Monday, urging Americans to reject what he called the Bush administration's legacy of "incompetence, negligence and failure." 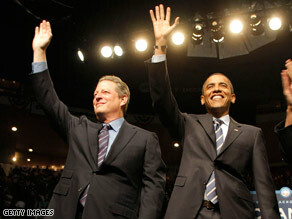 In Detroit on Monday, Al Gore endorsed Sen. Barack Obama for president. "Americans simply cannot afford to continue the policies of the last eight years for another four," Gore, the party's 2000 presidential nominee, told Obama supporters at a rally in Detroit, Michigan. Perceived as a senior statesman in the Democratic party, Gore brings a certain force to Obama's campaign, political analysts have said. Monday marked Gore's debut in the 2008 election; he had not weighed in while Obama was still battling Sen. Hillary Clinton. Amid thousands of cheering supporters, Gore began by addressing head-on the criticism that Obama doesn't have enough experience to lead the nation. The former vice president turned Nobel Prize winner playfully said he recalled one Republican nominee wondering out loud whether his Democratic rival for president was "naive and inexperienced." "And yet another said the United States cannot afford to risk the future of the free world with inexperience and immaturity in the White House," said Gore. "Who were they talking about? Every single one of those quotes came from the campaign of 1960, when the the Republicans attacked John Fitzgerald Kennedy for allegedly lacking the age and experience necessary to be president." Richard Nixon was the Republican nominee in 1960. Joining Obama in the midst of the candidate's two week swing through the nation to talk about his plans to revitalize the economy, Gore praised Obama as someone who could mobilize people, young and old, who had never before taken part in politics. Gore went on to praise the nominee's vision on the environment, domestic and international issues. Saying he will do whatever he can to support Obama's bid for the White House, Gore said Obama has "inspired" him. "I feel that same spirit in this auditorium tonight, building all over this country this year," he said. "Take it from me, elections matter," Gore said. "If you think the next appointments to our Supreme Court are important, you know that elections matter. If you live in the city of New Orleans, you know that elections matter. If you or a member of your family are serving in the active military, the National Guard or Reserves, you know that elections matter. Gore cited concerns about the environment, lead-painted toys and food safety -- even pet foods -- as other reasons to vote for the Democrat. "After the last eight years, even our dogs and cats have learned that elections matter," Gore said, adding, "After eight years of lost jobs and lower wages, we need change. After eight years of incompetence, negligence and failure, we need change." Gore said the Bush administration has "dishonored and disrespected" the Constitution and led the nation through "eight years of the most serious foreign policy mistakes in the entire history of our nation." The Tennessean newspaper noted Obama was among the few senators in either party who argued against the U.S.-led occupation of Iraq prior to the invasion Gore called a "blunder." He called for Americans to move beyond partisanship and select in Obama a leader who can "solve the climate crisis and create a bright future." GOP spokesman Alex Conant reacted to Gore's criticism of President Bush. "This election isn't about changing the past, it's about changing the future," he told The Associated Press on Monday evening. Calling attention to the fact that Gore's 2000 running mate, Sen. Joe Lieberman, has since left the Democratic Party to become an independent and is backing Sen. John McCain, he said, "It's telling that half of the 2000 Democratic ticket endorsed John McCain early in the campaign, while the other half waited until Barack Obama had been the presumptive nominee for weeks."